leaning. The maids can arrive at a convenient for the customer time every week or two weeks to sanitise and clean your home. Our domestic cleaning is available in and near London. It includes all the unpleasant household chores: tidying, sweeping, ironing, laundry, wiping the dust and others. Use our services to keep your house in a great condition without spending time in the exhausting cleaning work. The professional maids in our company have the necessary cleaning equipment and experience to deliver great results. Use our inexpensive and professional domestic cleaning. about the work which you expect from them. They can clean in a frequency which serves you. Use our domestic cleaning services which are at your disposal every day of the week in London. They include tidying, vacuum cleaning, sweeping, laundry, ironing and other work. The maids will disinfect and sanitise your bathroom, living room, kitchen and the rest of your rooms. Rely on them to maintain your house to be perfectly clean. essionally and will have the desired results. Use our top-notch domestic cleaning and leave your cleaning work to the qualified and skilled maids who work in our company. They will vacuum clean the carpets and upholstery, mop the floor, polish and scour all appliance and surfaces. The cleaning products which they use won’t risk your or your pets’ health. They are biodegradable and effectively remove stains, grease and dirt. Feel free to call us and book the domestic cleaning which you need any time. Our kind and helpful phone operators will arrange the most preferred day and time for your cleaning to be done. The maids in our company are professionally trained and will do every cleaning task and household chore. 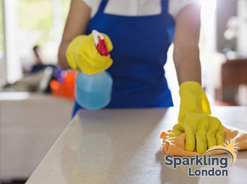 Rely on them to provide the domestic cleaning which you need in London or in the nearby areas. Our services are professional and available for one off and regular cleaning. Get in touch with out customer care centre for more information and arranging of your domestic cleaning. Copyright © 2019 Sparkling London. All Rights Reserved.